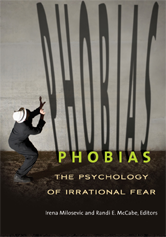 Editors: Milosevic, Irena and McCabe, Randi E.
Phobias: The Psychology of Irrational Fear is the definitive volume on a broad range of topics related to fears and phobias. After an introduction to the subject of fear and phobias, the encyclopedia presents A-Z, cross-referenced entries that address phobias from a variety of angles-types of fears, root causes, physiological and psychological effects, classification, and treatments. Ideal for both high school students and general audiences, readers will be engaged by high-interest content that not only details and explains various phobias but enables them to trace the history, theories, and practices associated with the study and treatment of phobias.